Jonathan Trott made an unbeaten 219, his highest score for Warwickshire, to offer slight hope of an unlikely final-day victory over Middlesex at Lord's. After resuming with his team on 146-4, the ex-England batsman helped the Bears reach 468, moving on from his overnight 62 to record his fifth double century - the second-highest score of his career. Keith Barker made 81 to help earn a 16-run lead before taking two wickets. But Middlesex's own double centurion Sam Robson saw his side safely to 76-2. On the back of his career-best 231 in the first innings, Robson was unbeaten on 35 at the close, aided by fellow England contender Nick Compton (34 not out). Earlier, fit-again England fast bowler Steven Finn added a third victim to match Tim Murtagh's three-wicket haul. 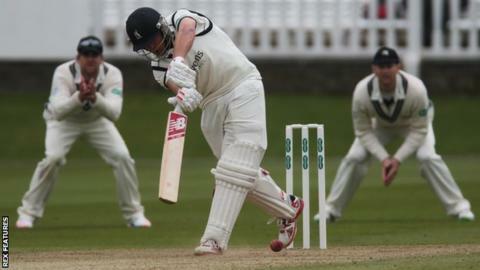 Warwickshire had looked in trouble when Toby Roland-Jones removed Tim Ambrose and Rikki Clarke to leave the Bears on 173-6, but Trott hit his first double century since making 211 not out for England Lions in January 2015. Batting under a new helmet to meet new ECB safety requirements, Trott and Barker first saw the Bears past their follow-on target with a stand of 143. He then received further support in separate partnerships of 64 with Jeetan Patel (30) and another of 67 for the last wicket with Oliver Hannon-Dalby (30). Trott's career-best score remains his 226 for England against Bangladesh, also at Lord's, in May 2010 on his first Test appearance at the home of cricket. His double century for England Lions came against South Africa A at Boland Park. Captain that day, Trott, now retired from Test cricket, was joined in the Lions side by Robson, his opposing double centurion in this match. "That was our first long day in the dirt of the season. We probably weren't quite at our best, but you have to give Trotty a lot of credit. "The game has been dominated by two blokes with the bat, as Sam Robson was brilliant for us. "We know how dangerous their lower order is. Barker and Patel have got runs against us in the past, and Barker played nicely. "All three results are theoretically possible. It will be interesting to see if the pitch does anything. It's been pretty true apart from the odd one." "It was nice. We were in a difficult position this morning. We lost two early wickets and we were staring at the follow-on. "But then Keith Barker played well and we put the pressure back on them. Once you settle at the crease it's a good wicket. "I enjoy playing at Lord's. I got into a good space. Milestones are nice. You work hard in the winter for these moments. It wasn't effortless. It never is. "I changed helmets overnight. I always had the other one with me. I probably should have worn this one last season. These are the stipulations and as long as that's clear that's fine. The new one just sits slightly differently."